Row 2 - (Inc Row) 3ch, 1tr into each of next 2tr, * 2tr into next tr, 1tr into each of the next 4tr, * rpt from * to * to last 4tr and 3ch to turn with, 2tr into next tr, 1tr into each of next 3tr, 1tr into top of 3ch. Turn. (62tr + 3ch). Row 3 - 3ch, 1tr in each tr to end, 1tr into top of 3ch. Turn. Row 5 - as Row 3. Row 7 - as Row 3. Row 9 - As Row 3. Fasten off. Turn. Commence with Skirt - Using colour 1, make 1ch, 1dc into base of 1ch, * miss 1dc, work 3tr into next dc, miss 1dc, 1dc into next dc, rpt from * to * to end. Turn. (34 groups). Row 12 - 3ch, 1tr into base of 3ch, * miss 1tr, 1dc into next tr, miss 1tr, 3tr into next dc, * rpt from * to * to last 3tr group and dc, miss 1tr, 1dc into next tr, miss 1tr, 2tr into last dc. Turn. Row 14 - 3ch, 1tr into base of 3ch, * miss 1tr, 1dc into next tr, miss 1tr, 3tr into next dc, * rpt from * to * to last 3tr group and dc, miss 1tr, 1dc into next tr, miss 1tr, 2tr into last dc. Turn. Row 15 - 1ch, 1dc into base of 1ch, * miss 1tr, 3tr into next dc, miss 1tr, 1dc into next tr, * rpt from * to * end, working last dc into top of 3ch. Turn. Rpt Rows 14 & 15 until 17 group rows have been worked from yoke or work measures approx 10.5 Inches from shoulder. Fasten off. Front and Neck Bands - Using 4.00mm hook and colour 1, starting at lower edge with RS facing and working into row ends, work 44dc evenly along up first front edge to corner, 3dc into corner, 1dc into each tr around neck, 3dc into corner, work 44dc evenly along and into row ends down second front edge. Turn. Next Row - 1ch, work 1dc into base of 1ch, 1dc into each dc to neck edge. Fasten off. With WS facing return to second side, working from neck downwards and starting with 1ch, 1dc into base of 1ch, work 1dc into each dc to end. Fasten off. Turn. Join in colour 2, 1ch, 1dc into base of 1ch, 1dc into each dc, up first front, 3dc into corner, 1dc into each dc around neck to next corner, 3dc into corner, 1dc into each dc down second front edge. Fasten off. Finishing - Weave in and trim off any loose ends of yarn. Close small gaps underarms. Sew 3 buttons evenly down front of yoke, use holes in the tr’s as buttonholes. 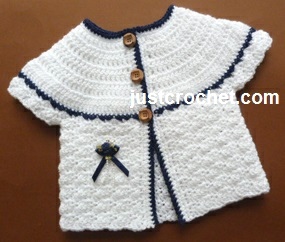 Hope you enjoy this free baby crochet pattern for a matinee coat.